In economics, human activities are categorized into four sectors or types of economic activities: primary sector, secondary sector, tertiary sector and quaternary sector. What are primary economic activities? Primary activities or primary industry comprise all economic activities based on the extraction or harvest of goods from the natural environment. These activities contrast with the secondary activities that produce consumer goods and the tertiary sector that offers services. Also, according to this definition, the primary economic activities are essential to no just the economy, but the survival of humanity because they produce essential goods to human life. Most of the products extracted from the primary economic activities are used in other industries where they become factors of production. For example cotton in the maquila of clothing, oilseeds in the manufacture of paints, wood in the manufacture of furniture, among others. While other goods from this economic sector do not need any transformation or very little before their final consumption. For example fruits, vegetables, and meats. Crop Production such as oilseed, grain, fruit, vegetable, melon, and tree nut farming and greenhouse, nursery, and floriculture production. Animal production such as cattle ranching; hog, sheep, goat, and pig farming; poultry and egg production; and animal aquaculture. Forestry and logging such as timber tract operations, forest nurseries, gathering of forest products and logging. Metal ore mining such as gold, iron, silver, copper, lead, and uranium. Nonmetallic Mineral Mining and Quarrying such as stone, crushed and broken Limestone and granite, construction sand and gravel, kaolin and ball clay, clay and ceramic. 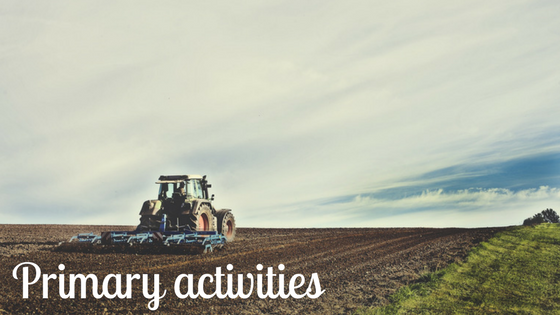 Centuries ago, primary activities were the main economic activity. For example, in the United States of every twenty workers, nineteen worked in agriculture, fishing, forestry, and mining. While today it takes less than one in twenty workers to feed more than 300 million Americans and get a surplus to export. Thanks to increments in agriculture productivity, we are now able to produce more food with fewer resources. Food is better and cheaper than 100 years ago, now we spend most of our income on goods and services like cars, smartphones, college, entertainment, etc. Today primary economic activities employ almost 40% of the world's working population. Although this participation is in decline and varies depending on the country. In Africa, for example, about 60% of the labor force is employed in the primary sector and in some regions of Asia 58%. Whereas in more developed countries of Europe only 6% and in the United States and Canada 3%. In many countries, a high percentage of the workforce works in this sector because of the low agricultural productivity. That is why primary economic activities are the most important sector in many developing countries, but not in developed countries. Even when most of the world's primary production comes from the latter. What are primary economic activities or primary industry? Definition. Examples of the sector, history and importance of primary sector.